I know you're busy. I know if it were up to you you'd be in some eclectic gallery right now taking in all the art. But there simply aren't enough hours in the day to for you to fulfill your craving for art. It isn't your fault. Luckily, you can actually see some stimulating art the next time you... catch the subway? In conjunction with the Colorful Daegu Festival that is happening this month, the Daegu Culture Foundation has organized an "Art Metro." If you are lucky enough, you'll catch this special train and find yourself in a different place, in a car full of art (a welcome change from those pesky adverts). 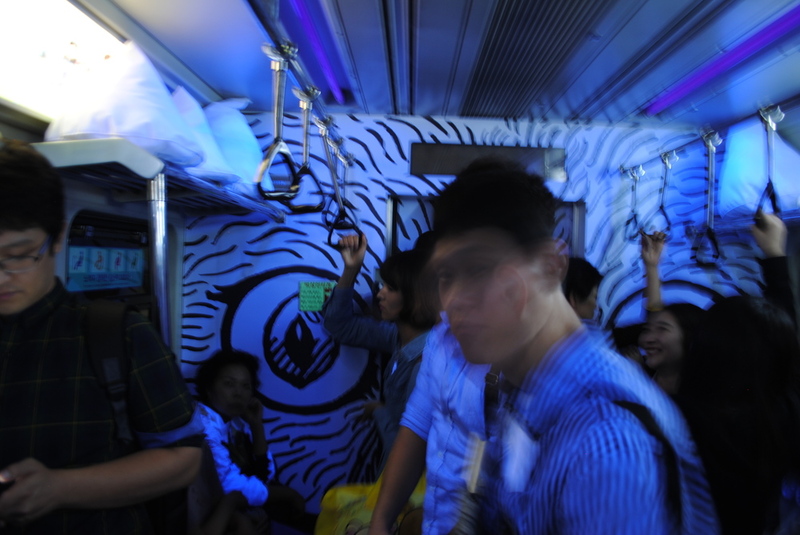 Until October 20th the Art Metro will run 16-18 times a day. According to a rough schedule that Colorful Daegu sent me, it looks like the train runs every other hour. I emailed Colorful Daegu via facebook with questions on how to see the train and found them to be very helpful. They'll give you the scheduled departure time from the station closest to you. Just keep in mind this train only runs on the RED LINE, line number 1. There are four carriages out of six whose interiors are covered with art. You can find more information about the artists and the content here. Our favorite car is a toss up between Hee Jeong's pink 2001-esq speed lines and Jae Ho's black and white monster, complete with black lighting and pillows lining the upper storage racks. Lee Jae Ho's work (above) feels like you've been swallowed by a Charles Burns beast. And that's a good thing. 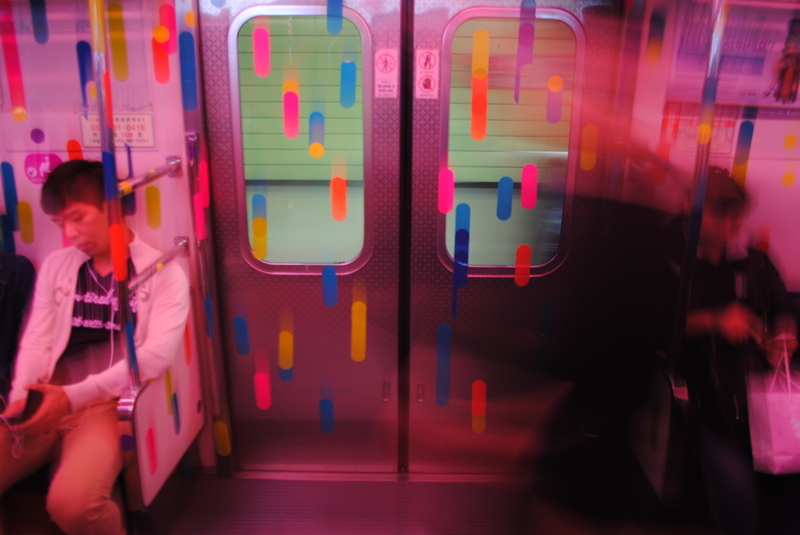 The train Hee Jeong designed is filled with colorful decals, all creating some fabricated acid trip. Half the fun is watching the reactions as other passengers board the train. Catching the train has never been so experiential. I'd love to see one of those buskers try to sell a knife sharpener in one of these!